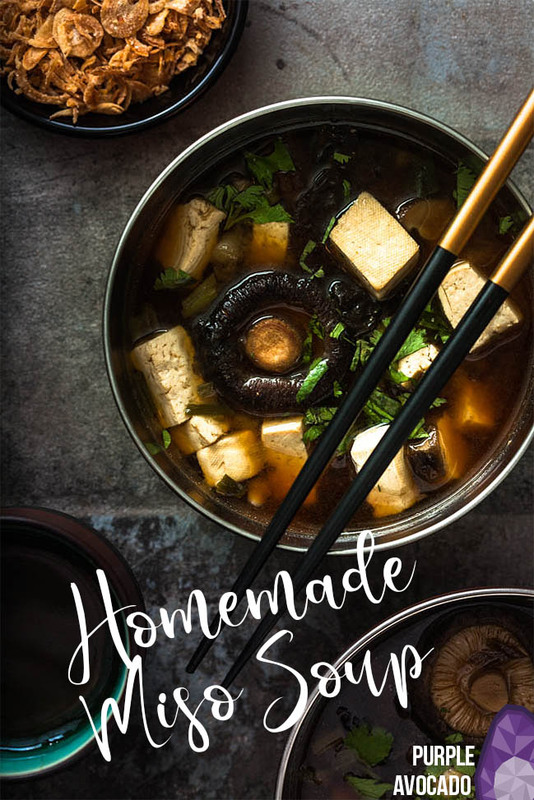 Today I have a healthy, vegan miso soup recipe for you, which you can either enjoy as a standalone main course or (if you omit the noodles) serve as a starter if you’re throwing a Sushi Party. This classic recipe from the Japanese cuisine really shouldn’t be missing on such a Sushi-loving blog. Miso paste* is the Japanese equivalent to our good old vegetable broth and is basically made up of fermented soy beans and salt. One of the many benefits of fermented products is that they are more or less non-perishable. I store my miso paste in a glass jar in the fridge but you can also keep it in your cabinet. There are three different kinds of miso paste, light, dark and red. I like to use the red miso paste for my soup yet you should just try out which one of the three you like the most. 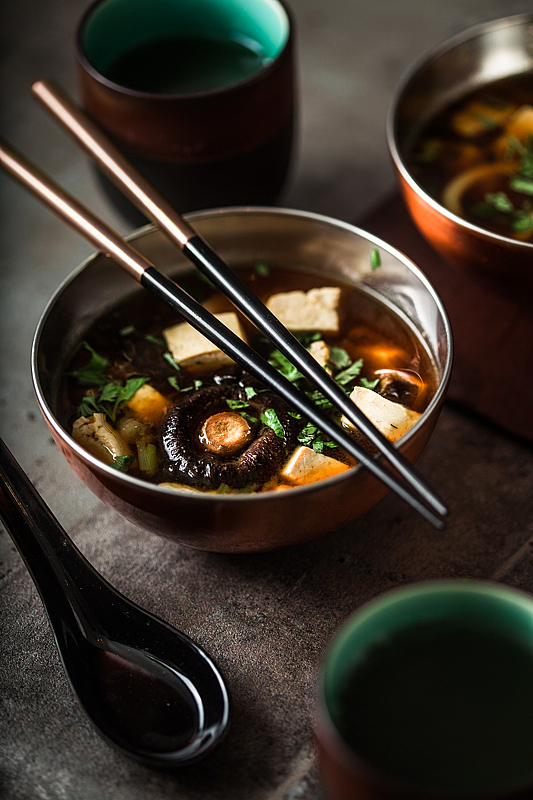 When buying miso paste you should pay attention to the ingredients if you’re on a glutenfree or vegan / vegetarian diet, since some of them may contain fish or gluten. Basically keep your fingers away from miso paste that has more ingredients than you have fingers on both hands. 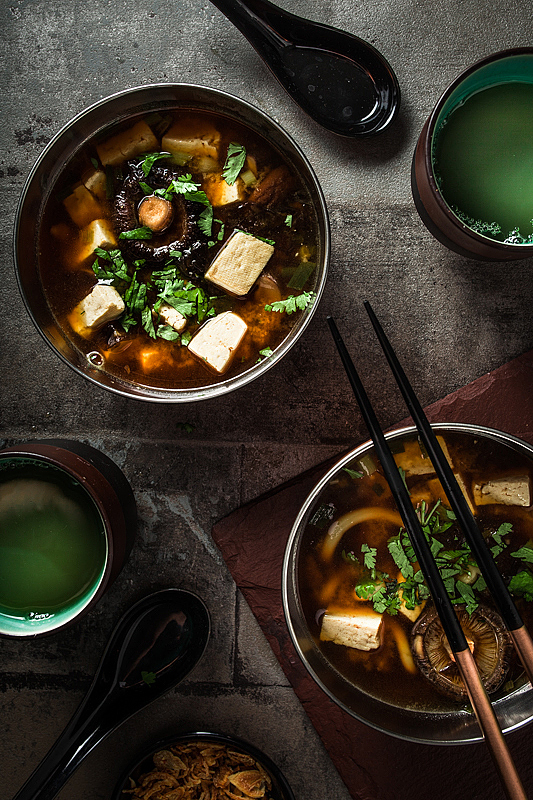 For miso soup you’ll need fresh, firm tofu. If you mistakenly take silken tofu, don’t use it for the soup as it’s too soft and make a chocolate mousse instead. My personal favourite tofu is from the organic brand Taifun (you should get your hands on their tofu in Germany and maybe in some other European countries). I just love the taste, the other tofu from the supermarket just can’t keep up with it. A miso soup wouldn’t be a miso soup if the seaweed was missing. So make sure to always have some dried seaweed*, or wakame, at home. Dried seaweed is very yielding and only a teaspoon should be enough for a bowl as it soaks in water and wells a lot. If you get your hands on fresh shiitake mushroom – Yay! Good for you! If not, give dried mushrooms a try. You can get dried mushrooms at Asian supermarkets (or online*). Before using them they have to be soaked in hot water for at least 20 minutes. Afterwards you can handle them like fresh mushrooms, slice and fry them. Note that the texture of dried mushrooms will be a lot more gooey than that off fresh ones – not everyone’s cup of tea (I love them). And what’s after the Miso Soup? If you’re like me, you’re probably of the opinion that a soup is not a ‘proper’ main course since it’s basically just liquid. My stomach usually demands something more ‘substantial’ before it even consideres sending some signals to my brain that tell me I’m full. 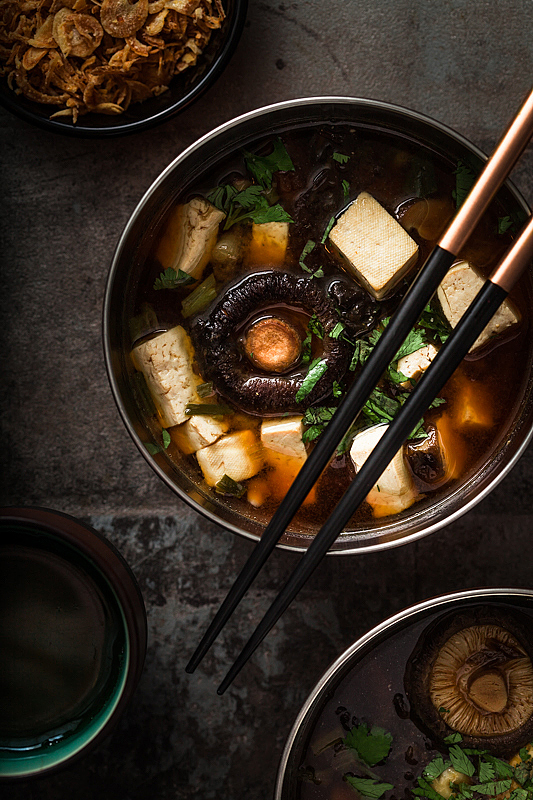 But rest assured, there are enough solid components in this miso soup, protein-rich tofu, shiitake and udon noodles, that’ll leave you full and happy after devouring it. Yet, you can have this beautiful soup as a starter as well, e.g. if you’re planning to have Sushi with friends. In this case I’d recommend to keep it simple and omit everything but the broth, a little tofu and some spring onions to keep the soup light. You don’t want to be full after your starter, right? Soak the dried shiitake for at least 20 minutes in hot water and cut them into stripes afterwards. If you're using fresh shiitake mushrooms remove dirt with a brush or soft towel. Dice the tofu. Wash and slice the spring onions. Peel and mince the onion and sauté them in a pot with some oil. Add the shiitake and fry them for another 5 minutes. Meanwhile, bringt 1 liter of water to a boil (e.g. in a water kettle). Add ca. 5 tablespoons of miso paste to the mushrooms and onions and stir everything together. Now deglaze everything with the boiling water and stir until the miso paste has completely dissolved (which should happen relatively quickly). Add the tofu, spring onions and seaweed to the soup and - if necessary - some more miso paste to taste. Once the seaweed is welled and soft you can add the udon noodles and let it simmer until they are ready. As the noodles are pre-boiled they are done within minutes. Serve in bowls and garnish with fried onions, chili sauce and herbs to taste. *affiliate links. I'm giving you those link so that you know, what you're looking for. You can get all those ingredients in Asian supermarkets as well as (organic) supermarkets. Would you like to learn how to take such moody photos? *This post contains affiliate links. Purchases made via those links won’t cost you a penny more, yet recompensate me with a little commission. Consequently, if you like one of the presented products I’ve be ever so grateful if you purchased it via my links as a form of appreciation for the work I put into my posts. It looks fantastic your miso soup and I am happy to have come on your blog that I know now, thanks to the fact that you won the overall for DMBLGIT. Thank you Sarah 🙂 And Happy Easter! 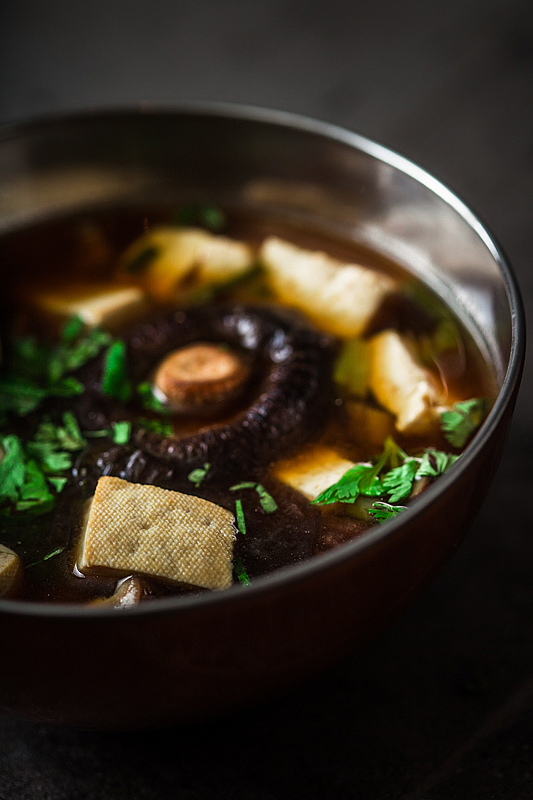 This miso soup looks delicious 🙂 I never realized that mushrooms were so healthy until I read this someplace. They are actually very good for you.